You can "feel" the city when you choose to walk. Photo by Ashley Bayles. 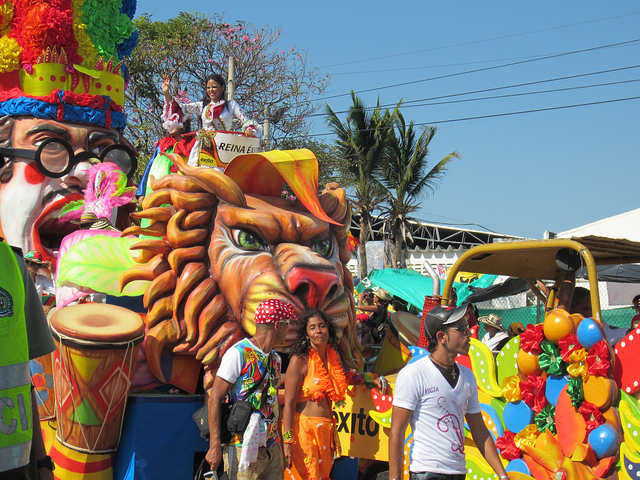 Last weekend, I enjoyed one of the most amazing and fun activities a city has to offer: I was part of “Carnaval de Barranquilla,” a UNESCO-recognized heritage event. The theme of the carnival is “El que vive es el que goza,” which translates to “Who lives it is who enjoys it.” I was fortunate enough to be part of a large comparsa, which is a dance troupe. We walked and danced the kilometer-long salsódromo of Via 40 to the tunes of the Caribbean star Elvis Crespo. As we walked and danced at the big party, I thought about why I was having such a good time. I realized this big social gathering was possible because we were all willing to travel by foot. By going on foot, we got to interact with the other members of the comparsa; we made eye contact with the onlookers and enjoyed our surroundings. We felt the city. While walking along the Via 40, images of amazing public spaces from my past travels came to mind, each one designed for walking and sharing life with fellow human beings: Venice, Italy; La Rambla in Barcelona, Spain; İstikal in Istanbul, Turkey; Malecón 2000 in Guayaquil, Ecuador; Plaza Hidalgo in the center of Coyoacán in Mexico City, Mexico; Beach Front in Copacabana in Rio de Janeiro, Brazil; Calle Huérfanos in Santiago, Chile; Rua das Flores in Curitiba, Brazil; Eje Ambiental Avenida Jimenez in Bogotá, Colombia; the new pedestrian Times Square and the High Line in New York City, New York; the waterfront in Durban, South Africa; Wangfujing Street in Beijing, China; Main Street in Walt Disney World in Orlando, Florida; Calles Florida, Lavalle and Puerto Madero in Buenos Aires, Argentina. Some of these examples are even listed by the Project for Public Spaces as some of the best public spaces in the world. There is no way you can have such an experience while sitting inside a motor vehicle, no matter how fancy or expensive that vehicle may be. To interact with other human beings, you need to go at their speed and be in the open. You need to dance and walk with them. Thanks to Barranquilla for closing streets to traffic and opening them up for fun, we had the chance to do exactly that: interact with each other. Other great carnivals of the world can be found in Venice, New Orleans, Rio de Janeiro, Brooklyn, Goa, Tenerife, Notting Hill, Oruro, Olinda and Trinidad. Have you been to a great carnival or public experience? What aspect of your environment made it memorable for you?